The legend started back in 1992. 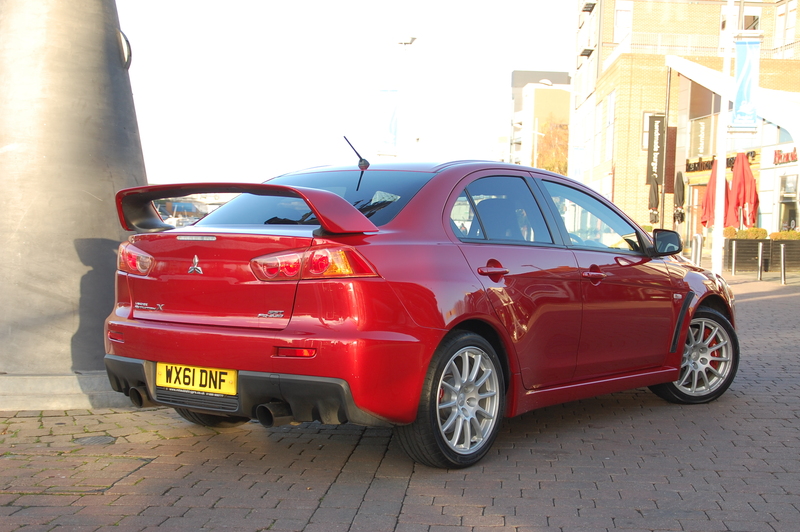 Mitsubishi had already fettled its potent Lancer GSR saloon into a promising rally car but it was now ready to up the ante. Enter the Evolution. 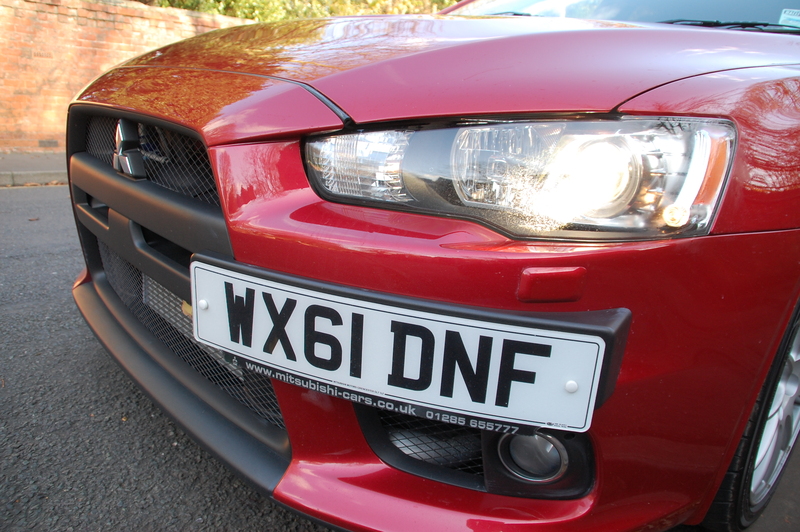 A honed version of the donor car that handled, went and stopped better than ever. The good news for customers, at least in Japan, was that a limited production run of road legal versions had to be built in order to homologate the design. 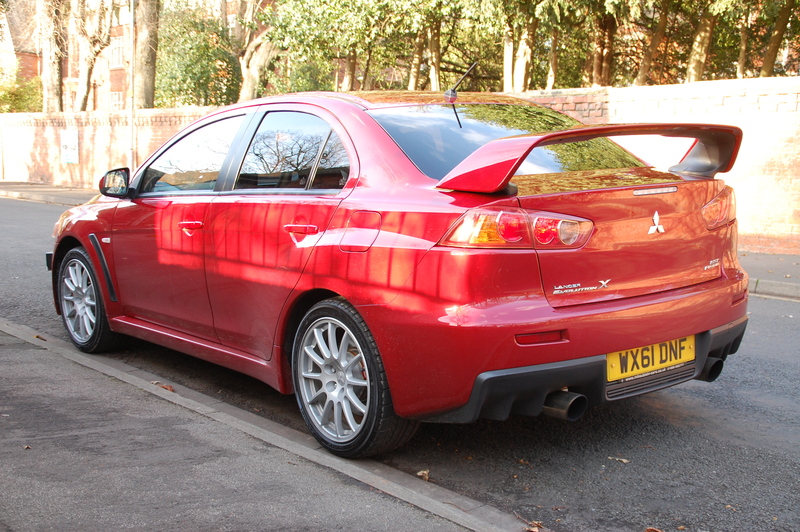 By 1999, Britain was becoming accustomed to seeing examples of the first five generations of Lancer Evolutions, which had made their way over here as grey imports. 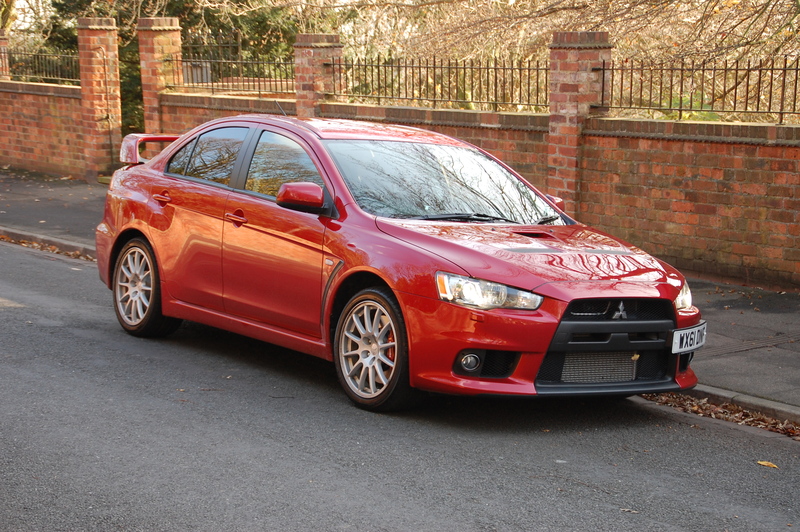 Mitsubishi, understandably, wanted to capitalise on the car’s potential and, using its Ralliart motorsport arm, began official sales of the Evolution VI (no Lancer badge on that first one). The press and public had a new rally-car-for-the-road hero and the Impreza Turbo’s dominance was broken. Time and progress march on and by 2008 both a new base Lancer and its Evolution, now up to the 10th generation, had arrived. So, is the Evolution X as good as its reputation suggests or has it entered the realms of automotive hyperbole? Let’s make one thing crystal clear from the outset. The Evo X is seriously fast. How fast? Well, you see that FQ-330 badge on the boot lid? 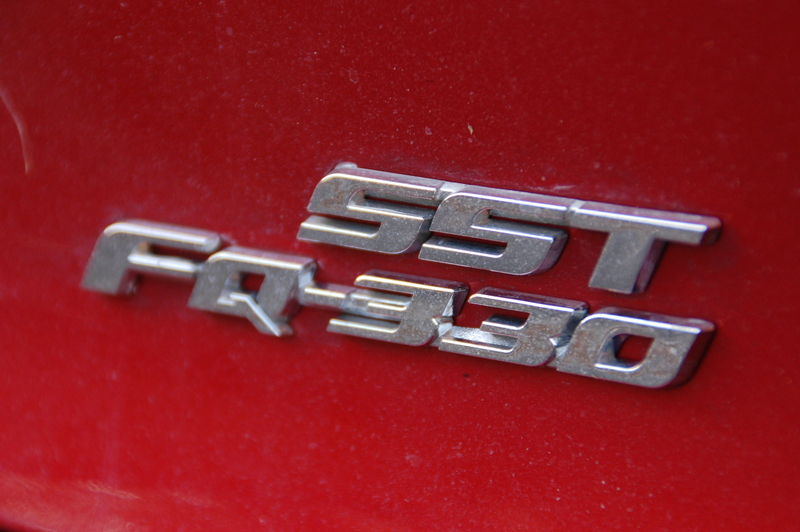 The ‘Q’ stands for ‘quick’; the ‘330’ for a rounding up of its power figure; the ‘F’..? To find out, nestle a passenger within the hip-hugging nearside Recaro seat, find a suitable stretch of road and floor the throttle. What they utter in exclamation is what the ‘F’ stands for. You get the idea. So, that'll be 'Flipping Quick' then? And being the FQ-330, this is only the mid-range model in terms of price and performance. Below is a version that gets by with just 295bhp (FQ-300) while above is a 354bhp edition (FQ-360). The limited edition FQ-400 is no longer available new. One can barely begin to comprehend its ferocity. When you first see the Evolution X, you can’t fail to be struck by its presence. There’s no denying it’s highly dramatic and certainly not pretty. Like most generations of Lancer before it, the basic design is mundane and, with its wings clipped, would pass you by on the road without even a cursory glance. In the process of being Evoed, the wings have been pumped up to shroud fatter tyres, a NACA duct sits centrally on the bonnet and the nose is all gaping vents and intakes – so much so that the front number plate has been moved to the left side of the bumper, Alfa style, so as not to interrupt the flow of air being sucked in through that black meshwork. The rear is festooned with a rear aerofoil of epic proportions and a straked under-bumper diffuser, complete with a pair of Mersey Tunnel-sized exhaust outlets. Subtle it ain’t. The styling seems to have the ability to appeal and repel in equal measure, ironically winning more favour with sub-driving age youths than it does with those who’ve passed their test. Me? I like the aggression of the nose. That huge, matte black trapezoidal grille, flanked by recessed and angry headlamps works well, and sends a message to anyone whose rear view mirror you rapidly loom large in. If I could I’d lose the rear wing and replace it with a discreet blade on the trailing edge of the boot lid, I’d be happier. Inevitably, wherever you drive it, people do look at you. In fact, people tend to turn around to stare because they’ve heard you before you’ve arrived. Sometimes they smile. Sometimes they shake their heads. Sometimes they mouth obscenities. It’s not that you’ll mean to drive it loudly, it’s more that it doesn’t do quiet. Just a light, urban potter along with High Street traffic sounds like a back garden firework display’s been set off under the bonnet, such is the level of banging and crackling going on amongst the metallic thrum of the four cylinder, twin-turbocharged power plant. All the more reason to avoid the urban jungle and keep the Evo on roads where it makes more sense. 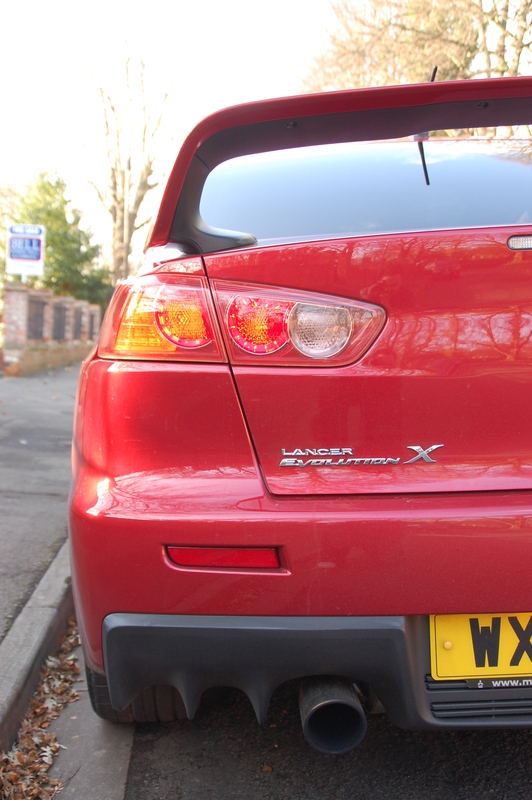 Which is a pity because driving the Lancer rides remarkably well around the town. Yes, it’s a stiff setup but it doesn’t feel harsh or even uncomfortable as you traverse urban pot holes and speed bumps. There’s no need to inch along at a mile an hour in order to preserve the front splitter as you mount a sleeping policeman. 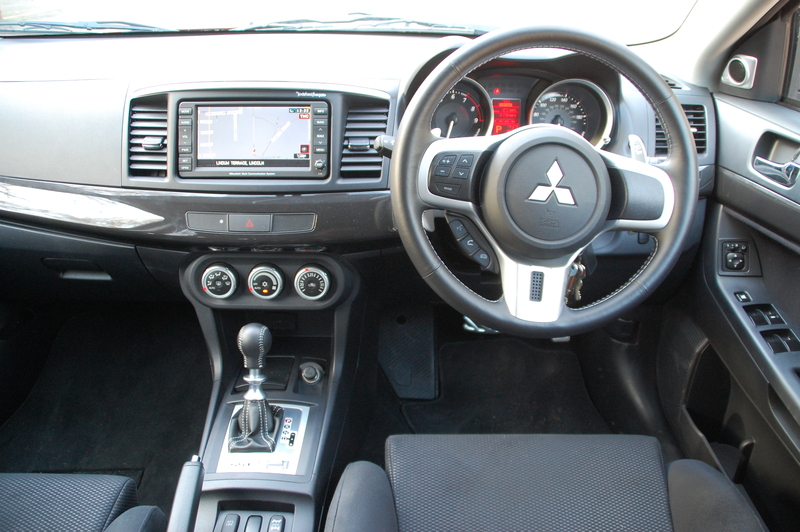 This Lancer Evolution X is equipped with the Sport Shift Transmission (SST) gearbox. Eschewing the traditional automatic for a sophisticated twin clutch manual makes a lot of sense in a car of this nature. Changes can be made in fully automatic mode or manually by rocking the gear lever to and fro or using the steering column paddles. The latter provide both a tactile and aural involvement as the aluminium levers feel well weighted and are cool to the touch on these late autumnal mornings. But flick down a couple of ratios, rather than one, and that engine barks and hollers with gratitude, the rev counter needle racing clockwise urging you to pull the right hand lever to upchange and press on. It’s funny how the lack of a real manual gearbox on the FQ-330 wrangles with some. I don’t subscribe to the perspective that a stick shift is the vital instrument from which to extract the final ounces of ability from a car, or necessarily that it makes you feel more in unison with the whole driving experience it can offer. I’d rank steering feel and the confidence inspired by the handling and grip as being far more important. 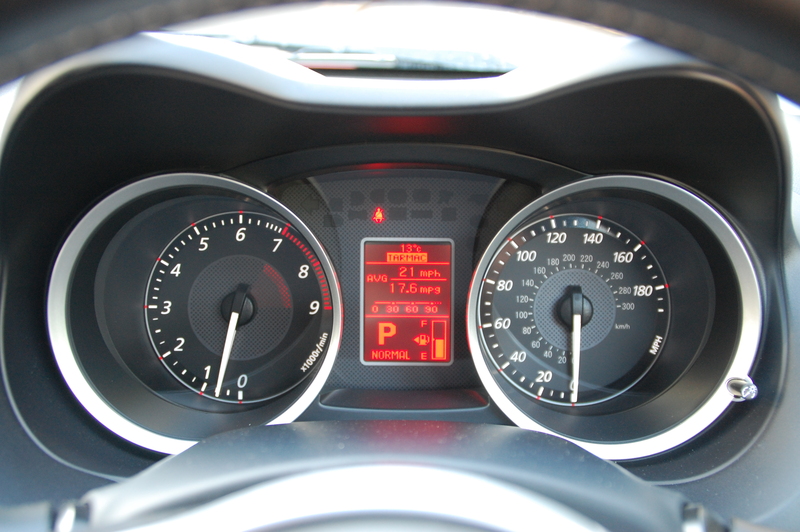 And confidence is one thing the Evo X brims you with after seconds behind the wheel. But if you must drive a manual, you’ll find a 5-speeder in the FQ-360. Prices range from the FQ-300 SST at £30,699 up to the fastest FQ-360 at £37,799. 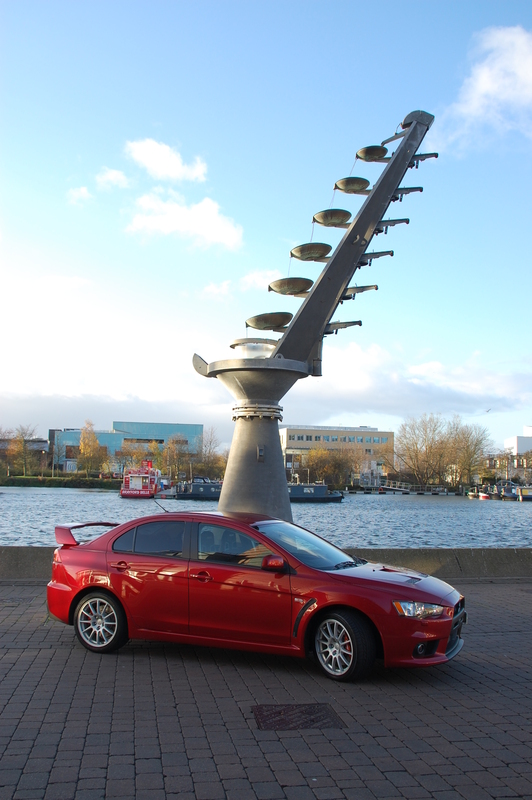 If you’re new to the whole Evo phenomenon, then you’ll be rather dumbstruck climbing aboard. Yes, this is a car that costs over £30,000 and yes, it has the potential to embarrass many an expensive sports car in relatively mediocre hands (read mine). 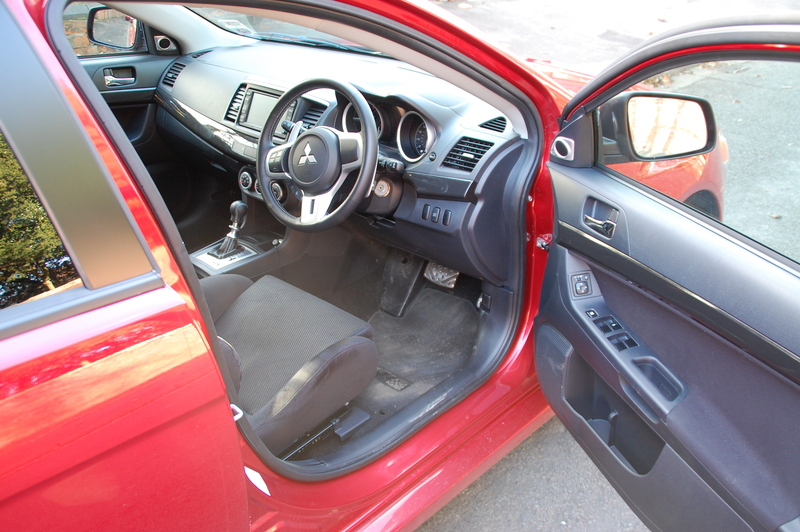 But the interior resembles something from the bargain basement category, albeit livened up with a few bits of electrical equipment to ease the pain. Touch those dashboard plastics and door cards and you’ll discover a grade of petro-chemical moulding you thought disappeared back in the late 1980s. Sure, they’re hard wearing but they don’t all feel as well assembled as you’d hope – telltale rattles were already apparent on a car with just 500 miles under its belt. There’s been little effort to embellish the cabin either in a manner to reflect the exterior’s brashness. A glossy grey plastic strip cuts across the dash horizontally and blends into the door panels, but the rest is straight forward and no-nonsense. Even the Rockford Fosgate infotainment package disappointed – not for its sound quality but for the ‘early days of satnav’ retro graphics used for the mapping display. Even the female voice that accompanied the verbal directions sounded authoritarian rather than soothing. A few niceties were present: electric windows and mirrors, climate control air conditioning, trip computer, Bluetooth connectivity and an electronic control to switch between Tarmac, Snow and Gravel settings for power delivery to the wheels. Settling in behind the wheel feels special though. The leather clad wheel is small and feels great to hold, and those aluminium gear paddles are within comfortable reach of your fingertips as they curl around the rim. The front seats are something else again: a pair of Recaro racing style chairs, upholstered in a grippy felt-like fabric. For those much beyond my non-waiflike physique, the bolstering might prove uncomfortable, but for the majority they grip and support marvellously. Whether your journey’s long or shot, sedate or manic, you’ll feel at one with your seat. The back ones are less successful. A combination of soft foam and a backrest that feels too reclined is not a good one, although it’s spacious enough back there, and could just about squeeze three adults in, although two would find it much less a game of sardines. If you’re intending to transport kids around in the rear, the outer seats being ISOFIX mounting equipped while privacy glass adds to comfort and security. 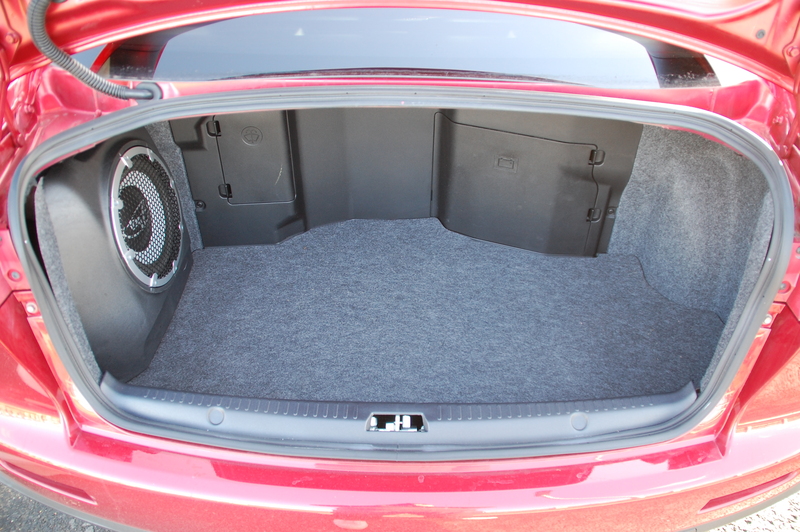 Pop the boot open and you’re faced with the prospect of 400l of somewhat awkwardly shaped space. It’s wide and deep, just not very long due to both the battery and windscreen washer reservoir being housed against the back of the seats, meaning they don’t fold to increase cargo capacity. There’s also a Rockford Fosgate woofer on the nearside too. 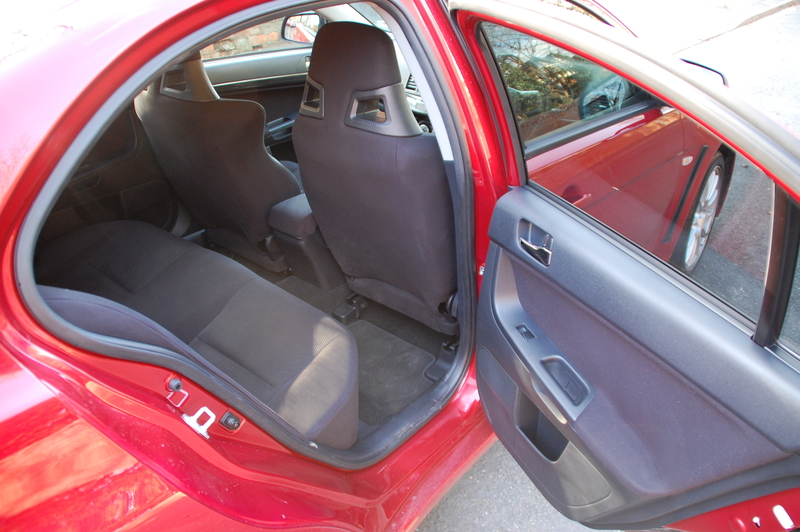 It all feels a bit, well, cheap back there with thin and, in places, badly fitting trim. Does it impress on the road? Whatever the type of road you choose to unleash the Evo’s ferocity you’re engulfed in an intoxicating mix of speed and drama. Dual carriageways and motorways become drag strip playgrounds as the throttle is forced into the carpet, reaching indecent speeds very quickly. The power just keeps on coming and coming as the speedo needle arcs evermore in a clockwise direction. A long straight on a private race track would see the 155mph limited top speed being achieved in no time at all. Billiard table smooth surfaces illustrate how easy a car the Evo can be to drive and if speed alone is your vice, the FQ-330 is a riotous and effective method of scoring a fix. But the Evolution X is more, so much more than that. Motorways don’t illuminate its prowess of maintaining speed whilst changing direction. Flooring the accelerator awakens the monster of a drivetrain, barking, whining and popping as it comes to life. If God ate Rice Krispies they’d sound like an Evo X on start-up as He poured on the milk. In the split second before the brace of turbochargers spin into life, there’s serenity about the cabin before the fires from hell are unleashed from the exhausts and you’re thrust back into your seat. The 0-60 sprint takes a claimed 4.4 seconds. It feels quicker. But now, you’re on a winding back road, with undulations, heavily sloping crowns for drainage and broken edges to the surface. Tackle this in a benign front driver and you’ll quickly reach the limits of the car, where going into a corner too fast not only brings on the understeer, forcing you to decelerate, but induces a feeling of dissatisfaction deep in your stomach. 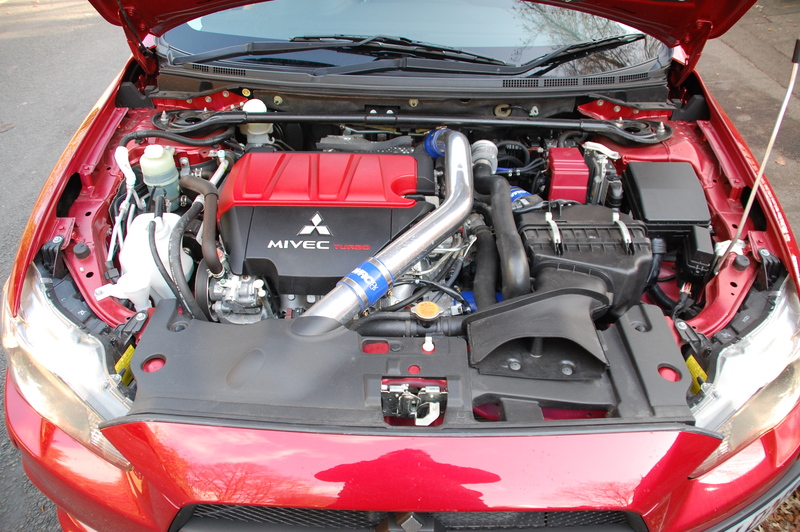 This is an alien concept to the Evo X. One of the most sophisticated chassis available in any car at any price, complete with four wheel drive, provides grip, grip and yet more grip. 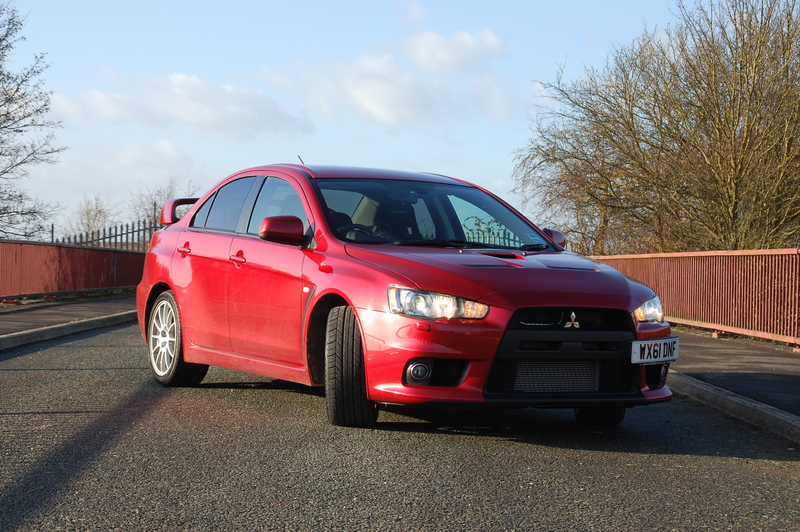 It’ll take you a few corners to begin to explore and appreciate exactly what the Evo will achieve, and even when you do so it’s unlikely you’re anywhere near the full capacity of its ability. Attack a corner you know well in the FQ-330 and it rides around it like it was a mere kink in a straight line. So you’re encouraged and obliged to eek out more speed on every attempt. And each time, it goes exactly where you point it, finding traction wherever it may be to haul you around the bends shouting “is that all you’ve got?” Whether you run out of balls or bravery first, one will eventually stop you pushing further, despite being safe in knowledge that the Lancer has even more in reserve. The steering is precise and responds to the smallest of inputs on the wheel, adding to the high speed safety and stability. Braking too is tremendous, with bright red callipers bearing the Brembo logos on display behind the multi spoke alloys. Fast to stop is neck jarringly rapid when it needs to be and, despite the heel and toe action in the pedal box to maintain speed, the huge discs suggested very little brake fade was occurring. Again, it inspires confidence. Pop the bonnet to inspect the engine and immediately the reason why the battery and screen reservoir are in the boot are obvious: there’s no room left at the front for much besides engine and its multitude of ancillaries. It’s not pretty but it’s devastatingly powerful. Back down to earth, for a moment, though when you happen to glance the trip computer’s fuel consumption read out. All the power and speed has to have a negative effect upon its thirst and in my case an average of 23.6mpg over the week is pretty woeful. In days of eco this and efficiency that, it’s no surprise that magazine reports from Japan suggest the Evolution XI may well feature hybrid petrol-electric technology. If you’ve experienced the immediacy of the acceleration in the minute i-MiEV, you’ll agree this is something to be embraced. The tank’s just 55l too meaning that whilst it’s a giant killer point to point, you’ll be forever filling it up again ready for the next run. 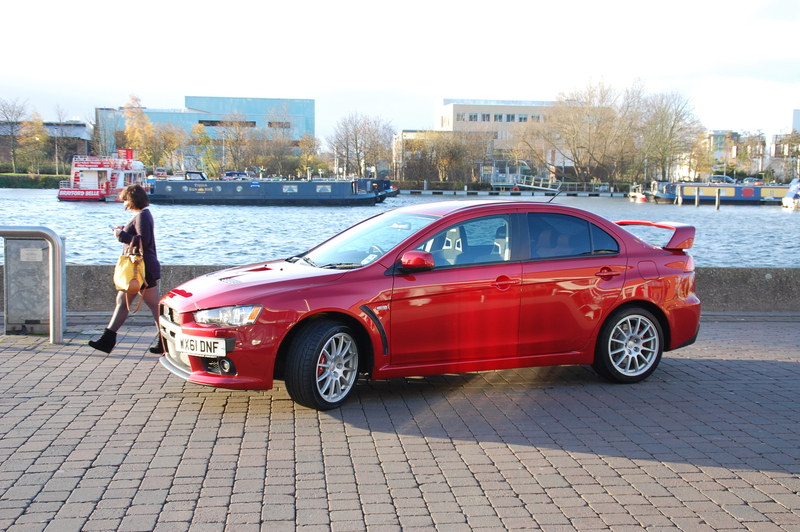 Mitsubishi’s Lancer Evolution X is a supremely talented weapon with which to attack B-roads, passing convoluted ribbons of tarmac quickly and with a genuine thrill at the sense of occasion. You get home after a thoroughly satisfying drive and immediately you’re itching for an excuse to get back out, taking the long way round, wherever you’re going. Does it look like £34,000 of car? It appears to have the right ingredients too in terms of being a practical proposition, with seating for five and a reasonable boot. With the automatically-operated transmission and sensible ride quality, it’s bearable around town too, providing you can brush off the stares. 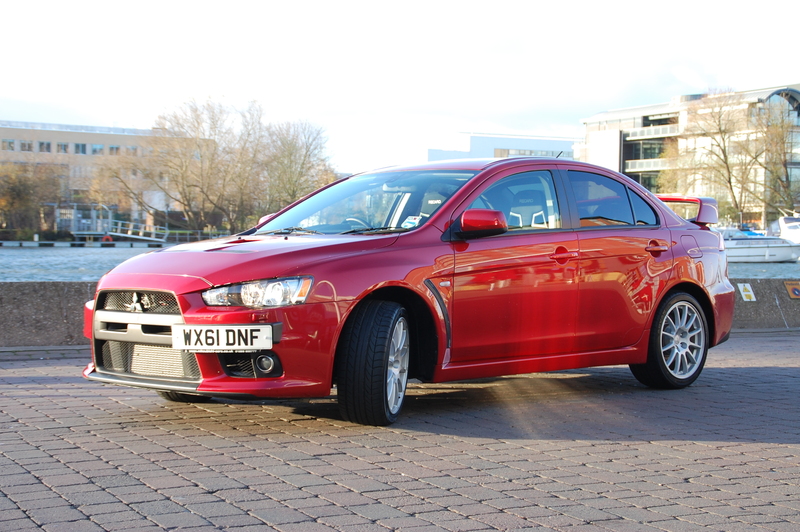 The Evo’s greatest asset is something that you can’t see but will experience when you drive it – its chassis. And what a platform it is, one that’s been honed and tweaked over the past 20 years, with a recognised pedigree. Those looks will doubtless put off a number of potential customers as it screams ‘fast car approaching’. Not everyone wishes to brag about the quality of their performance, after all. And it’s expensive, in terms of super unleaded, insurance and servicing costs. And that’s before you’ve remembered it’s priced at almost £34,000. All that money and you’ve got that disappointing interior to face every journey. And therein lies the Evo’s perennial problem. It might have the performance to make the earth spin anticlockwise if you drive from west to east and handle better than a Hotwheels car on a loop the loop track layout, but many would trade elements of both for the provenance of an alternative badge. Let’s put this in perspective: less than £3000 more buys you an entry level Porsche Boxster, for instance. Okay, only two seats and slower to 60mph, but with a higher top speed and greater fuel efficiency in a proper, slinky sportscar body. It’s tricky isn’t it? As thrilling a driving experience as the Evolution X is and as genuinely rewarding as it is to pilot, I’d spend my money elsewhere on a traditional roadster or coupé. It’s possibly just my badge snobbery shining through. But if someone else is spending, I’d certainly be encouraging them to have it right at the top of their list – just so long as I can have a shot when it’s on their driveway. Its been long we have seen any sprinter from Mitsubishi so here we are. Latest Lancer Evo X has been designed for sprinter enthusiasts Featuring powerful engine generating 276bhp at 6,500rpm and 311lb ft of torque at 3500rpm that allows to sprint 0-60 mph in just 4.9 seconds is just outstanding.